The blue Nikon COOLPIX AW110 Digital Camera is a rugged compact point-and-shoot camera that features a 16 megapixel 1/2.3" backside-illuminated CMOS sensor and EXPEED C2 image processing engine to produce high quality imagery with notable low-light sensitivity to ISO 3200. A NIKKOR 5x optical zoom lens provides a wide range of focal lengths to suit most shooting situations and lens-shift VR (Vibration Reduction) image stabilization helps to reduce the appearance of camera shake while working with longer zoom magnifications or in low-lit conditions. A large, bright 3.0" 614k-dot OLED monitor is available for image composition as well as playback and review of both still and moving images. Where this camera truly excels is in its ability to withstand extreme conditions while still fully performing. It is waterproof to 59' / 18m, freezeproof to temperatures as low as 14°F / -10°C, and shockproof to falls as high as 6.6' / 2m. Contributing to these durable standards, Nikon's Action Control gives greater operability by allowing you to seamlessly work with your camera with gloved hands. In addition to its capability to perform in these conditions, the AW110 can also instantly share imagery throughout your journey thanks to built-in Wi-Fi connectivity. This enables you to share still images and video directly with your iOS or Android device for uploading to social networking and image hosting sites. This connectivity is further enhanced by the inclusion of a built-in GPS transceiver, electronic compass, points of interest, and mapping features for you to plot out your adventures in-camera. Besides capturing high quality still imagery, the AW110 supports full HD 1080p video recording at 30fps with stereo sound. Movie recording is accessible via the dedicated movie button and an HDMI port is available for sharing your work on an HDTV. Wi-Fi connectivity allows you to directly share your imagery to any iOS or Android mobile device for instant sharing to social networking sites or via email. The GPS transceiver can automatically record locational data to the metadata of your imagery for plotting your journeys to maps using the included Nikon View NX2 software or to Google Earth, Google+, or other sites. The built-in electronic compass and maps help you navigate unfamiliar territory and the points of interest feature helps you locate nearby photo opportunities. The 16 megapixel 1/2.3" backside-illuminated CMOS sensor is able to deliver high resolution imagery with impressive quality and notable low-light performance. The combination of the CMOS sensor and EXPEED C2 image processor also afford high speed shooting capabilities up to 8 full resolution frames per second. Full HD 1080p video recording is possible at 30fps by way of a dedicated movie button. A built-in stereo microphone records high quality audio and an HDMI port enables direct sharing to an HDTV. A NIKKOR 5x optical zoom lens is integrated into the camera's design, giving a 35mm-equivalent focal length range of 28-140mm. This zoom range can be further extended to an effective 20x through the use of digital zoom, giving an equivalent focal length of 560mm. Lens-shift-type VR image stabilization helps to reduce the appearance of camera shake when working with longer focal lengths or when shooting in low-light conditions. Subject Tracking automatically detects a moving subject and ensures sharp, consistent focus is maintained during shooting. Motion Detection analyzes the movement of your subject and will automatically select faster shutter speeds and higher ISO sensitivities to better render moving subjects. Scene Auto Selector, Smart Portrait System, and 3D modes. In-camera image editing functions: Crop, Data Imprint, D-Lighting, Glamour Retouch, Quick Effects, Quick Retouch, and Small Picture. Supported Languages: Arabic, Bengali, Chinese (Simplified and Traditional), Czech, Danish, Dutch, English, Finnish, French, German, Greek, Hindi, Hungarian, Indonesian, Italian, Japanese, Korean, Marathi, Norwegian, Persian, Polish, Portuguese (European and Brazilian), Romanian, Russian, Spanish, Swedish, Tamil, Telugu, Thai, Ukrainian, and Vietnamese. 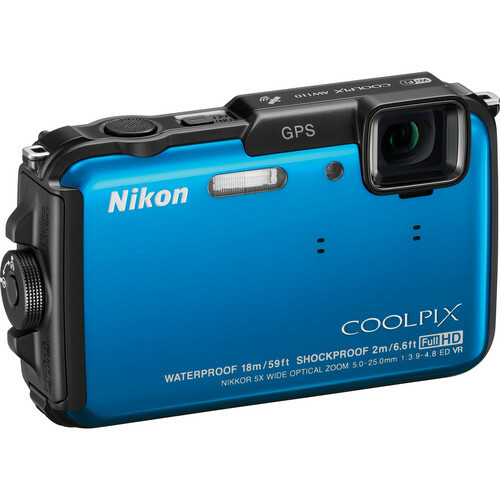 Box Dimensions (LxWxH) 7.8 x 5.3 x 3.3"
COOLPIX AW110 Digital Camera (Blue) is rated 4.5 out of 5 by 87. Rated 5 out of 5 by ChopperMac from WIFI setup instructions are murky Almost returned this camera because I couldn't figure out how to get WIFI to work - until I read others' reviews on the internet. What the manual fails to tell you is that the WIFI connection on this camera is as a hotspot - you connect your smart device (iPhone, etc) TO THE CAMERA's INTERNAL HOTSPOT, you don't connect the camera's wireless to an external WIFI LAN. And that's why they come up with such a nice complex name for the default local SSID. Great images and menu/display quality. Yet to run into issues with low light/high lens f-number. Really look forward to travelling and more outdoor adventures with this puppy. Rated 5 out of 5 by Arianna from Under the Sea and On Land Beautiful While on vacation during our dive last year, we noticed this camera being used. Although a little pricey, did my research and went back to B&H again! The camera was so easy to use for both my husband and myself. Well we just went crazy taking pictures of each other as well as turtles and different color fish. Couldn't wait to get back to the room to transfer pictures to the computer. They were great. Am I happy, yes, did I make the right choice, you bet I did, the land pictures came out beautiful also. I haven't seen a bad picture yet and it is easy to read and learn, one, two and three! Oh the perfect size for travelling!!!! Rated 5 out of 5 by Jay-Z from Solid, Great Images Use this camera as a back-up to your digital SLR and something that you will comfortably keep in your pocket or strung on the handy lanyard around your neck. It takes great photos, easy to use, and you don't worry if you hit a rainy day or your adorable daughter drops it. In that sense, good to hand off to others to take photos of you enjoying your vacation w/out having a lot of explanation or trepidation. Easy directions; many options if you want to delve into it more, and the video is plenty good for short clips. Tough to see the LCD screen in the sunlight. So what else is new? I would highly recommend this camera. Rated 5 out of 5 by Larz from Great Camera My husband and I bought this camera for hiking/camping trips primarily but we have used it for just about everything. We are not pro's with a camera but did our research and this is the one that seemed to fit the mold for us. So far, we love it! It takes great pictures day and night in all types of conditions. I have fully submerged it in water on more than one occasion and have had no issues. We have not yet tried out taking photos under water. At this point the only con I have is the controls can be tricky. My favorite feature is the motion stabilizer because it really works and it's nice for someone that may not have a steady hand or for trying to take pictures on the go. Rated 5 out of 5 by Hall Traveler from Great camera! I bought this camera specifically for snorkeling and outdoor activities since it was waterproof. I was hesitant at first to take it in the water however it held up just as promised. Pictures were of great quality when I returned from using it and overall the camera was very easy to use. I would highly recommend this anyone using it in water or outdoors pictures. The camera picks up excellent colors. The only con I found is that it often takes some time to focus when using underwater and zooming in. Rated 3 out of 5 by Chris the Kayaker from What a huge disappointment I bought this camera to take on a 5 day kayaking trip on a remote Utah river. I brought two fully charged batteries, and only took 100 pictures. But both batteries were exhausted by the end of day 2. I suspect the GPS feature kept trying to find a location while I was traveling through deep canyons. Either way, this was insult upon injury, as I bought it a few days before leaving on the trip after having to return another less expensive Nikon waterproof camera because the display failed on that unit. Nikon couldn't replace it, and are refunding that money. But it seems that choosing Nikon again after the first failure was a mistake. Rated 5 out of 5 by Egidio from Better, more useful features I use this camera primarily when I'm outdoors biking, kayaking, etc. Its rugged body is perfect for that. I do not have to worry if it gets wet or I drop it. The GPS feature is great. I used to own the previous AW100 and thought the GPS signal was slow. In the AW110, I get a GPS signal within seconds. Another useful and new feature is the Wi-Fi option. Nice addition! Rated 4 out of 5 by captainifr from Nice Point & Shoot Good little camera. I'm biased toward the high-end DSLR so it's hard for me to say good things about the quality when comparing them. This camera has cool features and actually takes better quality photos than all the cameras in the point and shoot category that I have used in the past. It always uncomfortable to submerge underwater, but this camera performed great in the pool and snorkling in the ocean. Wanted to take it diving, but dive master said we were going to about 60 feet and I wasn't ready to use it near it's limit on it's first day. I only wish it had a manual mode.